Bernie Sanders, independent socialist Senator from Vermont, announced his presidential candidacy last week to much fanfare. He is set to be one of the strongest 2020 Democratic candidates as his socialist positions ascend to the party’s mainstream. But he has a problem: his past brief moments of immigration patriotism. In recent years, Sanders has echoed the talking points of his Democratic colleagues on immigration. He’s called Trump a racist for trying to reform our broken immigration system. He’s supported Amnesty for the DREAMers and wants to abolish Immigration and Customs Enforcement. [Bernie Sanders Calls To Abolish Immigration System, Restructure ICE, by Lydia O’Connor, HuffPost, July 3, 2018] . But Sanders wasn’t always like this. 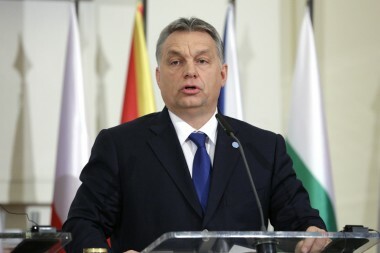 For years, he made the economic case against mass immigration. He voted against Amnesty in 2007 because he said it would hurt American workers. Sanders didn’t stick to this stance in 2013 when he voted for the Gang of Eight Amnesty. But he still expressed his economic argument against mass immigration. 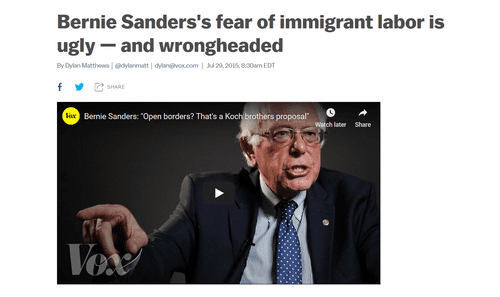 Bernie’s insistence on opposing Open Borders and framing it as an evil libertarian plot was reflected in an op-ed written by then-campaign staffer Richard Eskow for the senator’s website. “[O]pen borders]” is a superficially attractive idea – until it’s subjected to critical thinking, at which point its true nature is revealed. Its proponents attempt to make a “moral case” in its defense. But there is no moral case to be made for sacrificing democratic decision-making and national sovereignty to oligarchic and corporate whims. Of course, while Sanders’ rhetoric is nice, it doesn’t make up for his more recent comments and immigration agenda. Bernie’s 2016 platform read like a wish list for the Open Borders billionaires he claims to despise. It called for the legalization of all illegal aliens, the dismantling of “inhumane deportation programs and detention centers,” reversing “the criminalization of immigrants,” giving free healthcare to migrants, and the expansion of the Diversity Visa system. But the platform did insist on securing the border and support for e-Verify—two ideas you will not hear from the other 2020 Democratic hopefuls. Sanders’ 2020 agenda will likely ditch the two bits of immigration patriotism in favor of the Democrats’ current Open Borders preference. However, that quick conversion may not be enough to protect Sanders’ from xenophobia accusations. Identity politics will dominate the campaign cycle, as Bernie knows well as an old white (Jewish) guy struggling to win over an anti-white party. His strong criticism of Open Borders–now the de-facto Democrat position—will embarrass him and likely lead to a clarification that essentially endorses Open Borders. Pro-worker Democrats now have to pretend immigrants don’t hurt working-class Americans and that the Koch brothers are xenophobic. No criticism of Open Borders will be tolerated and any mention of immigration’s harmful effects on American workers will be prohibited. Sanders has struggled to master the Democrats’ new standards. Last June, he stood up for ICE and said he opposed its abolishment. He received a ton of flak for that position and was forced to reverse himself a month later. [Bernie Abolishes His Opposition to “Abolish Ice”, by Ethan Epstein, Weekly Standard, July 17, 2018] There’s a good chance he will continue to flub on immigration and trip over the dictates of Open Borders dogma. But Gillibrand got her start representing a red-district in upstate New York and she likely adopted her earlier positions to appeal to her conservative voters. It was pure politics; once she realized it was more advantageous to become an Open Borders advocate, she chose that path. Sanders is different. His past immigration views were supported by his socialist worldview and appeared to reflect his personal views on the matter. He maintained these views even when they began to hurt him politically. But the Democrats have become so radical and intolerant of deviation from open borders dogma that Bernie has to conform to the party line to survive. His candidacy would quickly die and the young socialists would flee from him if he kept his old immigration views. Democrats care more about foreigners than workers, and Sanders upholds that preference with his current alignment. I think Sanders is a strong contender in the 2020 primaries. His economic positions are popular, he has high likability and high name recognition, and he has a strong infrastructure in place for his new presidential run. But he has a vulnerability when it comes to his identity and his old views. Sanders’ main rivals will exploit his past immigration views to paint him as a white racist. And that may well be enough to wipe away the Vermont senator’s advantages in the race. Open Borders is no longer a libertarian fantasy–it’s the Democratic platform. Bernie will pay the price for failing to embrace it sooner. After Shutdown Retreat, Trump Has Three Weeks to Save His Presidency. Maybe He Will. 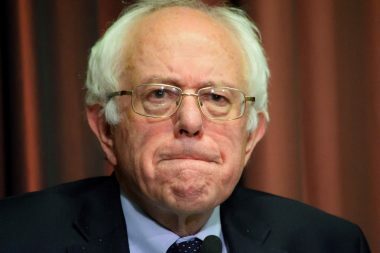 4 Comments to "Bernie’s Past Common Sense On Immigration Will Haunt Him In 2020"
Sanders in later years has become more willing to give up principle to be considered acceptable. His acceptance of most of the imperialist viewpoint and the relative cowardice revealed by his eagerness not only to campaign, but to campaign strongly for the establishment candidate in 2016 whose apparatus had defrauded him of the nomination in 2016 reveals his limitations as just one more member of the corrupt power structure which is a blight on the US and, through it, the world. That 2007 Sanders is the one I remember. Since he was one of the few Democrats acknowledging any of the real labor issues over the decades, Sanders’ candidacy made it harder for lifetime Dems, like me, to make the switch in 2016, but Trump sounded like he might be on the up and up about ending mass-scale, welfare-supported, wage-undercutting illegal immigration and reducing legal immigration that has the same effect at the bottom of the wage scale. Another key issue that drives wages down for the many, many individual citizens with no spousal income who must live on earned-only income is welfare and child-tax-credit-supported single motherhood—a phenomenon that old-school Republicans used to critique on moral and economic grounds. I thought, well, maybe, Republicans represent individual citizens more than Democrats who definitely do not. Republicans do represent wealthy individuals, but not working individuals who fall outside of the “working families” category. Many of us in the likely voter category, which is not a particularly youthful and womb-prolific demographic, do not, in fact, fall into that working-families-with-kids-under-18 category that both parties pander endlessly to. The wage-undercutting group of moms with .gov-augmented wages do not just hurt the reviled group of single, childless, non-welfare-eligible, non-tax-favored Americans. This welfare-subsidized labor pool also hurts noncustodial parents of kids under 18 and the single, non-welfare-eligible, non-tax-favored moms with kids over 18 who mostly work in low-wage, female-dominated jobs. It is hard to compete with moms who employers describe as having “somethin’ comin’ in” from spousal income, child support that covers rent or monthly welfare—covering everything from food, to rent to electricity, plus monthly cash assistance and up to $6,431 in refundable child tax credit cash. No illegal alien drives wages down any more or less than moms with unearned income streams—moms willing to work for less than it takes to cover rent alone on earned-only income. Contrary to the claims of Democrats of all stripes, these moms are not working hard. The fake-to-the-max lauding of them as hard-working families is simply a lie. They work part time or in a temporary capacity, purposefully keeping their income below the earned-income limits for welfare programs. I switched parties, even voting for Republicans in the mid-terms, only to find out that both parties wholeheartedly support pay-per-birth welfare for single moms and legal / illegal immigrants. Democrats support it for votes, assuming that unregistered single moms and non-eligible noncitizens actually vote, and Republicans support it to keep a ready and willing labor pool of government-supported workers who can afford to work part time for beans. The welfare-mom labor pool is another Koch Brothers plot that Bernie failed to point out in his 2016 campaign. Actually, it goes way beyond the Koch Brothers, encompassing almost every office-job category, including most of the lower level corporate jobs in financial services. Bernie naively glorified welfare moms. Unlike Republican welfare supporters, he did, however, get at the issue diagonally by ribbing Bezos about hiring a large percentage of welfare-assisted employees. I thought Bezos was known for working his employees hard. But to qualify for welfare, single-breadwinner parents cannot work hard. To stay below the earned-income limits for the programs, a womb-productive citizen or noncitizen must submit proof of part-time work to caseworkers. Full-time work—even at minimum wage—goes over the earned-income limits for the programs, albeit womb-productive temp workers go on and off of the programs, dropping the welfare during months when they go over the income limits. They still get the up to $6,431 in refundable child tax credit cash each year at tax time, calling it their “taxes.” Many hardworking part-time workers report spending their “child” tax credit money on beach trips with boyfriends or $900 tattoos. I have never spent that much—or even close to that much—on my childless *** in my late-middle-aged, college-educated, white-privileged life. I don’t care how many kids these citizens and noncitizens have pumped out through the noble act of copulation, that is plain wrong, and it makes a mockery of hard work. Hard work and quota meeting does not even guarantee a one-room apartment, but producing kid after kid that you can’t afford, in conjunction with part-time work, guarantees an independent household paid for by Uncle Sam with up to $6,431 in extra mom-pampering spending money on top of your monthly .gov stipend. Not only must the non-welfare-eligible citizens compete with citizens bouyed by this wage-undercutting medley, but we also must compete with noncitizens, paid in increasing amount by our goverment per kid produced. Bernie’s shift from a true labor advocate on Lou Dobb’s show in 2007 to an amnesty-supporting Gang of Eighter just a few years down the road might have something to do with the change in the union movement. Union leadership used to oppose wage-undercutting immigration, but they changed, saying immigrants are easier to organize. What few of these so-called labor advocates take into consideration is the leverage-busting force of automation. There are already not enough full-time jobs for immigrants. That is why immigrants qualify for so much welfare. Immigrants usually get the max in welfare because of maximum womb productivity, but they cannot qualify for welfare unless their traceable income stays under the earned-income limits for the programs. That is only goung to get worse as automation keeps eliminating jobs, and the social unrest is likely to be much worse in the USA, as robots keep replacing humans. That does not even take into consideration the damage to the environment, a top priority for Bernie, an environmentalist who nonetheless believes that goverment should pay citizens and noncitizens in increasing amounts per little natural-resource consumer produced. It also hurts the college students that Bernie wants to liberate from tuition costs. We already have an oversupply of college grads, competing for scace middle-class jobs, and since every married mom must work in a family-friendly / absenteeism-friendly job, those few household-supporting jobs are concentrated in fewer households. The more immigrants who stay here, qualifying for minority scholarships and chasing scarce household-supporting jobs, the less even a free degree means in the marketplace. A degree often equals a series of $12-per-hour churn jobs. Even with zero college loan debt, that type of employment does not cover the cost of a one-room apartment. The Bernie of 2007 was right: the last thing a true labor advocate should support is mass immigration. The 2007 Bernie would have kept a lot of those Rust Belter cross-over voters who trusted Trump to end illegal immigration. Far more of them show up to vote, whereas there might have been one of the glorified Bernie-babe voters in the long, winding lines that I stood in to vote twice for Trump. There was one college-aged girl in Birkenstock’s and one twenty-something couple in MAGA hats to more than cancel out her lone vote. Young people attend more trendy rallies, but most of the people pulling voting levers are past reproduction age, with a fair sprinkling of 30-somethings who fit into that so-called working families category targeted in all of the policies offered up by politicians, but not even close to the number of voters 45 and over. Agreed. It’s to late for Bernie to become an idiot now. Besides HE IS WHITE. What could he possibly be thinking. Somebody needs have him committed or a least take away his car keys.